Control what you can control. There's no mantra uttered more often across the Minor Leagues than that one, and there may not be a pitching prospect who took that lesson more to heart in 2018 than Padres right-hander Chris Paddack. The latest stats-based edition of the Toolshed turns toward FIP, or Fielding Independent Pitching. The stat has become more en vogue over the past few years, but for the uninitiated, FIP tries to evaluate pitchers based on factors that are in their control and are not dependent on the defense played behind them. That means hits, runs, earned runs, etc. aren't used. Instead, FIP considers strikeouts, walks, hit batsmen, home runs allowed and innings pitched. Weighing each of these components by their in-game impact, the FIP formula works out to ((13*HR)+(3*(BB+HBP))-(2*K))/IP + constant. (FanGraphs goes deeper into FIP's equation here.) For the purposes of this story, the constant, which is used to place FIP on a similar scale to ERA, used here was 3.56 after combining data from all 16 domestic Minor Leagues. Put all of that together, and these were the best Top-100 prospects from the 2018 season, according to FIP. Paddack obviously jumps out from that list, but he didn't just lead Top-100 prospects; he also ranked 15th in FIP among the 1,830 pitchers to toss at least 50 innings in the Minor Leagues this season. Perhaps it should come as no surprise that San Diego -- which features six pitchers among MLB.com's Top 100 prospects -- tops the category, given the organization's approach to pitching-based stats. "We put an emphasis on walks, strikeouts and soft contact," said Padres pitching coordinator Eric Junge. "Everything else kind of takes a backseat. Those three things will translate into other good things, if we keep our focus there. ... We try to keep it simple with our pitchers. We tell them not to worry about ERA or wins. Take care of the walks. Take care of the strikeouts. Get some soft contact. The other things will follow." That's a pretty simple roadmap to dominating the FIP category, but it's of course easier said than done. That was particularly the case for Paddack in 2018, given what he needed to do to get into the Top-100 picture in the first place. The 22-year-old right-hander was taken by the Marlins in the eighth round of the 2015 Draft and had gotten off to an exceptional start at Class A Greensboro (0.95 ERA, 48 strikeouts, two walks in 28 1/3 innings) during his first full season in 2016 when he was traded to the Padres for Fernando Rodney on June 30. He made three starts for Class A Fort Wayne before suffering a torn ulnar collateral ligament in his right elbow in July, an injury that required Tommy John surgery. Paddack missed all of the 2017 season as a result, and when he tried to return to the mound for live batting practice during the instructional league, more arms woes led to another immediate shutdown. San Diego took it slow with Paddack upon his return in the spring and held him back until his season debut on April 30 with Class A Advanced Lake Elsinore. From there, the Padres put their then-No. 23 prospect into a six-man rotation and held him to a per-start pitch limit of about 85 pitches, hoping he could hold up after months of rest and rehab and return to the form briefly shown two years earlier. "Once he got past all the hiccups and showed he could respond to a six-man rotation and not only respond but compete, that's when I felt like we were OK," Junge said. "He needed to be able to throw 15 starts in a row, and through all his hard work, he got there. Once he did, he really crushed it." Pick a FIP component, and it's easy to see what made Paddack stand out upon his return to the mound. The most impressive might have been his control. Despite all the time off, the 6-foot-4 hurler had no trouble finding the strike zone with regularity between Lake Elsinore and Double-A San Antonio. He didn't walk more than one batter in any of his 17 starts, and he only issued eight free passes to the 340 batters he faced in the California and Texas Leagues. His 2.4 percent walk rate was tops among the Top 100 prospects, easily beating out Jonathan Loaisiga (3.6 percent) in second, and ranked 11th-best among all Minor Leaguers with at least 50 innings. After walking 3.3 percent of the batters he faced in 2016, this was a return to form, but not one that necessarily came easy, given all that happened between the two seasons. "There's nothing specific or fundamental-based we went over with him when it came to control," Junge said. "It was just about hitting targets with purpose and intent. For a guy like him, all he needs is the carrot and the challenge, and he did the rest himself. During the throwing program we had him on, he was always focusing on peppering his partner right there in the chest over and over and over. But it wasn't just his 60-grade control that made Paddack stand out on the mound in 2018. Even though opposing batters knew he was going to fill up the zone, they still couldn't touch his stuff. His 35.3 percent strikeout rate topped all Top-100 prospects -- McKay was second at 34.4 percent and average among the elite group was 25.7 percent -- thanks to the two plus pitches in his arsenal. The heater hits the low-90s, and as evidenced by the control numbers, is capable of hitting all four quadrants of the strike zone. But the changeup might unlock the key to the K's. The off-speed offering comes in the mid-80s, but isn't considered a plus-plus pitch just for its difference in velocity. "It's command and deception, but deception over everything else. You can't sit changeup with him. I don't hear anyone saying, 'Well, he's a great changeup hitter' about any hitter, and that bodes well for the weapons he's got going right now." That's not to say, however, that Paddack has the perfect profile yet. Because of the limits placed on him by the Padres, he only managed to complete six innings in five of his 17 starts, with only two of those at Double-A. As Paddack works deeper into games in the upper Minors, he'll need to have more offerings to keep hitters at bay, and that's where the development of the breaking ball comes into play. Paddack's curveball is, what Junge called, an average pitch at present, one the Texas native can use early in the counts, but not one he can rely on to get late swings-and-misses. When Paddack picks up his throwing program again in mid-to-late November or early December, that breaking ball will become a focus, and that'll continue through Spring Training, when he'll likely be part of the 40-man roster with his Rule 5 eligibility coming up this winter. 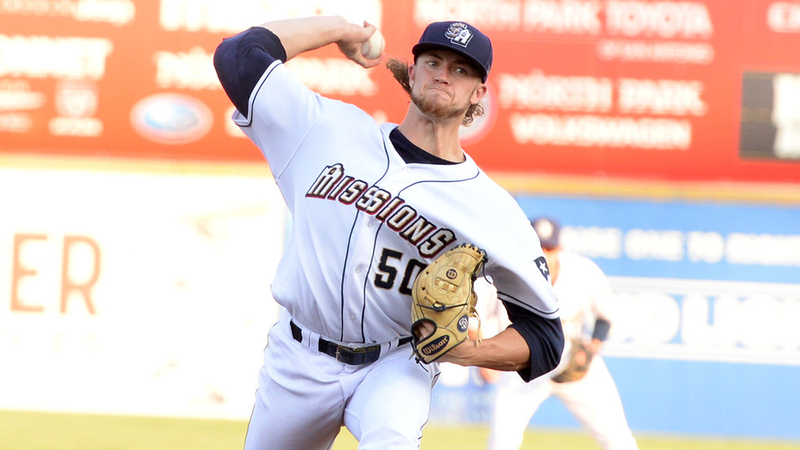 That development could determine whether Paddack's future in an impressive San Diego system is as a frontline starter or more of a No. 4 or 5 rotation option. One thing's for sure, the Padres' No. 5 prospect is carving out a role for himself as one of the Minors' most statistically exciting pitchers. "We just wanted him to go out, stay healthy and get himself about 100 innings or so, and hopefully we could parlay that into 2019," Junge said. "But he really checked every box and then some. Now, we're looking at 2019 and expecting even higher things than we thought we could just a couple months ago." -- Consider FIP another point in favor of McKay sticking on the mound. The 22-year-old left-hander, who suffered oblique injuries this summer, was limited to 78 1/3 innings across three levels in his first full season, but made the most of them with a 103/14 K/BB ratio. That 7.4 ratio was third-best among Top-100 prospects with at least 50 innings this season. McKay, who earns above-average grades for his fastball, cutter and curveball, will be tested at higher levels, so it'll be interesting to see whether he can keep up the whiffs while pitching in the zone consistently against tougher competition. At the very least, his pitching results were more encouraging than his hitting ones in 2018. -- The biggest gaps between ERA and FIP belonged to three 2017 first-rounders: MacKenzie Gore (5.19 ERA, 3.33 FIP), Hunter Greene (4.48 ERA, 3.37 FIP) and Shane Baz (4.47 ERA, 3.94 FIP). That ties into the Sept. 12 Toolshed on BABIP (batting average on balls in play) in which all three were featured among the four highest BABIPs against. Playing at the lower levels, Gore, Greene and Baz didn't have the best defenses behind them, and by combining FIP and BABIP, it's easy to see how their ERAs were inflated by the extra balls in play that fell in for hits. Of the three, Baz's 3.94 FIP in the Appalachian League isn't quite notable as he was hurt by allowing 29 walks in 52 1/3 innings, but it's an improvement on the more traditional statistic. But it explains why Gore will enter 2019 as one of the game's top left-handed pitching prospects, even after experiencing some bumps with Class A Fort Wayne in terms of ERA and injuries. -- The prospect who benefited most from ERA was Indians right-hander Triston McKenzie, who posted a 2.68 mark in 90 2/3 innings with Double-A Akron. The 21-year-old's 3.85 FIP was notably higher, due in part to allowing eight home runs over 16 starts. As such, McKenzie ranked 10th among Top-100 prospects with at least 50 innings in ERA, but finished 29th in FIP.